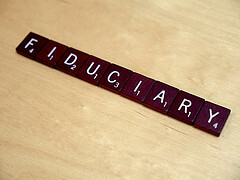 And what might a fiduciary be? Many people connect this word exclusively with money, but the concept is actually much broader. A fiduciary (in Latin, fiduciarius, “trust,” from fides, “faith”) is anyone whose duty is to act in faithfulness to the interest of another, even at cost or peril to himself. A parent, for example, is a fiduciary for his or her children and must care for them, no matter how much sacrifice that might require. The stewards in Jesus’s parables, who managed the master’s property while he was absent, are fiduciaries. The board of a business corporation holds the company’s assets as a fiduciary for the stockholders. Since the stockholders’ main goal, ordinarily, is to make money, the duty of a corporate board is to increase stockholder value. If the board seeks other goals—by pumping up executive compensation, making sweetheart deals with other companies owned by board members, or sometimes even trying to be responsible corporate citizens—they can expect to be accused of failing as fiduciaries. A congregation’s board is a fiduciary, also. Like a for-profit board, it controls property in behalf of its real owner. But who is the owner? Members of the congregation often answer this too quickly: “We members are the owners!” And the members’ interest? Satisfactory worship, education, social action, and so on. The fiduciary duty of a congregation’s board, in this view, is to know what the congregation wants and to provide it—a concept not so different from the political and commercial concepts of the board described above. This way of thinking sometimes produces good results, but it is based on a false assumption. A congregation does exist to serve its owner—but the members of a nonprofit organization do not “own” it as stockholders own a business. Stockholders can vote to sell the corporation’s property, pay its debts, and divide the remainder among themselves. A congregation—or any other nonprofit—that did likewise would be violating several state and federal laws. The most fundamental legal principle of nonprofit corporations is that they must use their resources exclusively to serve the purposes for which the state has chartered them. In the case of congregations, the charter purposes are relatively broad. For that reason, and because a congregation is exempt from many of the tax reports required of other charities, leaders sometimes forget that there is any limitation at all. But a congregation may not distribute its resources for the “personal benefit” of anyone—especially an officer or board member—except as reimbursement of expenses or fair compensation for services provided. For-profit corporations are required to benefit their stockholders, while nonprofits are forbidden to benefit their members. To call the members “owners” under these conditions stretches the idea of ownership quite far. Who, then, is the owner of a congregation? Who plays the role of the stockholders in a business? Not the members. Not the board. Not the clergy or the bishop or the staff. All these leaders are fiduciaries, whose duty is to serve the owner. Symbolically, we might say God or Jesus is the owner, and that might be a correct interpretation. But God is too big a concept to guide decision making helpfully. The specific “owner” that the board must serve is this congregation’s mission, the small piece of God’s will that belongs to it. Or to put it differently, the congregation’s job is to find the mission it belongs to—the real owner for whose benefit the leaders hold and deploy resources. The primary measure of a governing board’s success is not the balance in the bank, the shortness of board meetings, or the happiness of congregants. A congregation’s “bottom line” is the degree to which its mission is achieved. The mission, like stockholders in a business, has the moral right to control the congregation’s actions and to benefit from them. Because the match between a congregation’s mission and a corporation’s stockholders is so close, it seems to me helpful to say that the owner of a congregation is its mission. An interesting corollary of this line of thought is that when members of the congregation vote, they, too, vote as fiduciaries for the mission. Like the board, each member has a duty to make sure the congregation serves its mission—to vote as a fiduciary for the owner—even if that goes against the member’s preferences or wishes. When a member’s private interests are in conflict with the congregation’s mission, the member’s duty is to vote the mission. And what is the mission? The great management consultant Peter Drucker wrote that the core product of all social-sector organizations is “a changed human being.” A congregation’s mission is its unique answer to the question, “Whose lives do we intend to change and in what way?” What this means for a particular congregation at a given time is never clear or obvious, and so articulating mission is a continuing task. But a congregation that avoids that task—that simply seeks to please its members or keep doing what it has done in the past—falls short of its true purpose. Growth, expanding budgets, buildings, and such trappings of success matter only if they reflect positive transformation in the lives of people. The board’s role, then, might be summarized as “Owning the place in behalf of its mission.” To be sure, the board is accountable to the members who elected it, and perhaps to other stakeholders as well—but achieving the mission is what the board is accountable for. Dan Hotchkiss consults with congregations and other mission-driven groups from his home near Boston. This post is adapted from Dan’s best-selling Alban book Governance and Ministry: Rethinking Board Leadership, which has helped hundreds of churches, synagogues, and non-profit organizations to streamline their structure and become more mission-focused and effective.